I came to cake decorating with a background in studio art (specifically mixed media sculpture), and I’m mostly self-taught – books, trial and error, and patience, with the occasional class mixed in. What I love about making cakes is that it lets me combine my passion for art and design with my love for all things sweet. I’m very much driven by process and craftsmanship and draw my inspiration from art, nature, and patterns.Today, I run a one-woman studio bakery in Portland, Oregon called AK Cake Design. 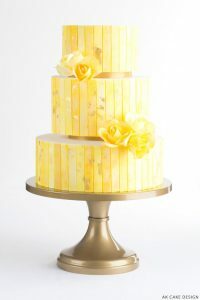 Here, I focus exclusively on wedding cakes, specializing in clean, modern designs. I hope to give you a little insight into my cake world – from original concept to final product. I’ll be trying out new techniques, playing with materials, talking about design, and having some fun with cake! AK Cake Design has been featured in the pages of Brides Magazine, Martha Stewart Real Weddings, Portland Bride & Groom, and Oregon Bride and on these cool blogs: Martha Stewart Weddings, Brides, Colin Cowie Weddings, Style Unveiled, Wedding Chicks, Elizabeth Anne Designs, and, of course!, The Cake Blog. 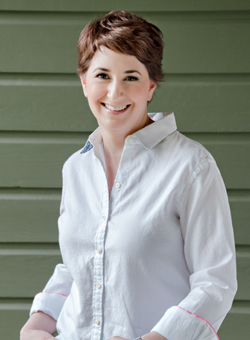 Allison Kelleher is also a Craftsy instructor. 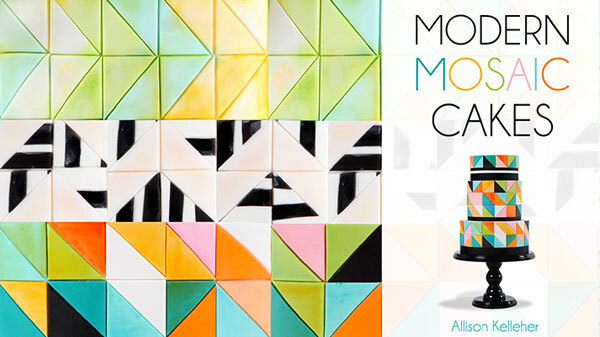 Her class Modern Mosaic Cakes is currently available online at Craftsy.com. Building On A TechniqueOur contributor, Allison Kelleher of AK Cake Design, is back with a gorgeous new design and some insight on her creative process.... Today I’m going to talk a little about one of my favorite topics – the process of creating. Over the past few months, I’ve been obsessed with stripes. 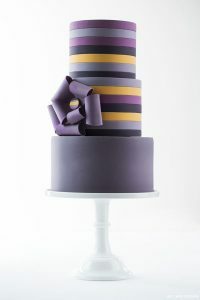 It started with my purple cake and a straightforward method for making horizontal stripes. 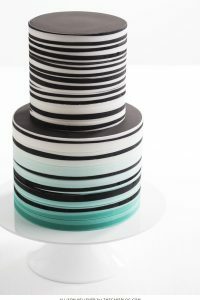 With my black and white cake, the stripes morphed into something more organic and my embedding technique was born. 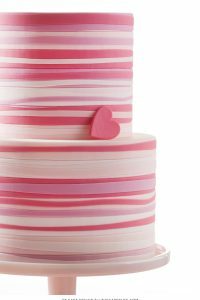 I continued with my pink Valentine’s cake – experimenting with color and a more complex pattern. And I’ve most recently created this gradient-colors version, combining black and white with subtle color play. Technique + ImaginationToday is the start of a new mini series all about cake artistry! Three of our contributors teamed up on a project conceived to challenge each other while inspiring all of us. We talk about inspiration and techniques all the time here on The Cake Blog. But how do you take those concepts and translate them into your own cake designs? It's a process that every cake designer must go through, time and time again, as they build their skill set and define their own personal style. Because really, cake artistry starts with a solid foundation of technique and then blooms with imagination and creativity. So let's join Allison Kelleher, Erin Gardner and Erica OBrien as they each design a cake incorporating the other's signature techniques. 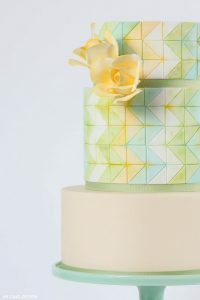 Golden Yellow & Saffron CakeOur contributor, Allison Kelleher of AK Cake Design, is sharing one of her latest designs... I was honored to create a cake for the launch of the new Picture Perfect cake stand collection from Sarah's Stands. 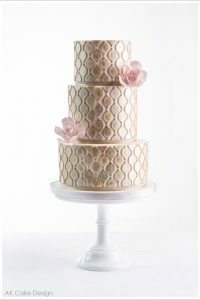 My design is based on the Heart of Gold cake stand, which is a rich, yet subdued color and has a lovely antique feel to it. The cake itself was inspired by a Rothko painting. I love the vibrant tones of yellow and saffron and wanted to harness the way they glow. For me, the Heart of Gold was about the center or intensity of gold. The 1st Cake of ChristmasI can hardly stand it! It's finally time to kick off our third annual holiday series.... The 12 Cakes of Christmas!! Over the next month, we'll be oohing and aahing over twelve marvelous cake designs, created especially for this series! All brand new, never seen before, and created by some of your favorite bakers! For our theme this year, we're taking a moment to reflect on our favorite Christmas memories and traditions. As the month of December rolls on, our days often become saturated with to-do lists and holiday tasks. The merriest time of year becomes the craziest time of year! So throughout the hustle and the bustle, I hope you'll check in and let us provide you a little refuge from the holiday mayhem. Because here on the blog, we will be celebrating the little things that make this season shine bright. Each of our featured bakers was asked to create a cake based on a classic Christmas tradition. So let's get started! Our first cake celebrates one of the most recognizable symbols of the holiday season. A twist of red and white peppermint that's sticky sweet and smells like Christmas. 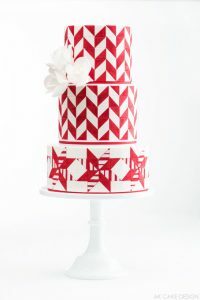 The First Cake of Christmas was inspired by .... candy canes! Metallic Watercolor CakeI think I should start with a confession. I am slightly obsessed with today's cake. Alright, alright. Slightly obsessed is a bit of an understatement. I am totally obsessed with today's cake! Today's feature unites three of summer's hottest trends in one design that is far more gorgeous than 'trendy'. Allison Kelleher, owner of AK Cake Design in Portland, marries watercolor, metallics and stripes into one stunning trifecta of style. We've been loving these three independent trends all summer long. But just wait until you see them pulled together into one cohesive design. It's elegant, sophisticated, timeless. And SO right-now. Allison applies her signature watercolor technique (you can find her tutorial here) to create a soft shimmer of metallics in gold, silver and copper. Iridescent strips alternating with white to create a subtle striped pattern. It's a shining example of trends done right and I have a feeling.... you're going to be obsessed too! How To Paint A Watercolor CakeLately, I’ve been playing around with ‘watercolor’ painting – the traditional technique – very much like you would do on paper – but without paper or water! When I came across this lovely Rex Ray painting, I knew it would be the perfect inspiration. The colors are so fresh and pretty, and they blend together beautifully. 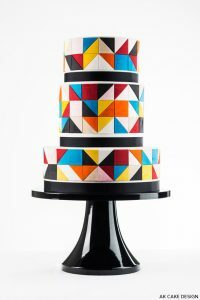 Color Block CakeFor me, making great cakes is always about process and craftsmanship. 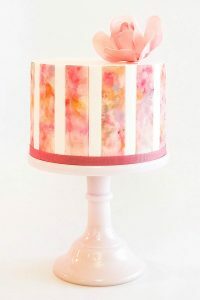 I really love the act of building something with my hands: playing with shapes, colors, and textures – to create nuance and what I like to call an ‘intricate simplicity.’ I’d say about 10% of my time goes into design – and 90% is devoted to creating a perfect foundation: delicious cake, straight lines, smooth fondant. As I see it, you can’t make a great cake (or a great anything!) without a great base to build on. 2nd Cake of ChristmasYesterday, The 12 Cakes of Christmas officially began! I'm thrilled to say that this is the second year for this cake series. And it is bigger and better than ever! Twelve days of beautifully festive cakes, created especially to inspire you to holiday greatness! Twelve talented bakers were asked to create innovative and elegant designs appropriate for both Christmas parties and winter weddings. And along the way, we get an up close look at what inspires this talented group. It’s 12 bakers baking…. it’s The 12 Cakes of Christmas! The second cake in our series comes to us from Allison Kelleher, owner of AK Cake Design in Portland. You may remember Allison from previous features on our site (like this one and this one). She stole your hearts last year in The 12 Cakes of Christmas with her snowy white cake. And this year she'll have you swooning again! Allison combines her refined sense of style with her love of patterns to create something truly spectacular! It's time to put your coffee down and have a seat because today’s cake may simply take your breath away! It's time for The 2nd Cake of Christmas! Autumn Blooms CakeEverywhere I look, the holiday season is upon us. Retail stores are prepping for Christmas shopping. Holiday catalogs are arriving in the mail. Blogs are posting new Christmas inspiration. Pinterest is full of crafts and recipes to try! But I try not to rush the season here on the blog, when possible. So I'd like to linger and celebrate feeling of Fall, just a little while longer. Which happens to be a pretty easy task when you have a spectacular Autumn cake to swoon over! With deep rich tones and a soft feminine flair, today's cake is an elegant spin on the colors of fall. And you're going to love it! Shades of grey fade to a shimmery purple. An abundance of sugar blossoms create a delicate, ruffle-like appearance. 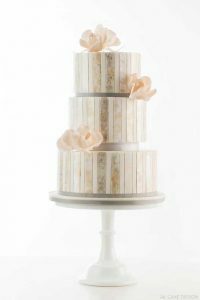 A short but sweet top tier showcases a single rose. Oh my goodness! 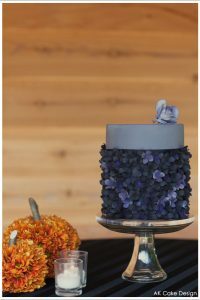 It's a stunning cake covered in Autumn Blooms, created by Allison Kelleher, owner of AK Cake Design in Portland. 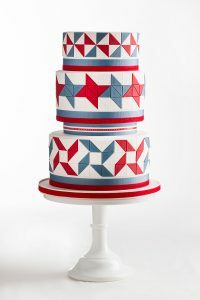 American Quilt CakeToday is the first day of our newest cake series, The 4 Cakes of July! Four talented bakers were asked (pretty, pretty please) to create new designs inspired by the 4th of July holiday. To bring the beauty and colors of the American flag to life in a sophisticated cake design. There will be no flag sheet cakes here... these cakes are gorgeous and like none we've seen before. Red, white and beautiful cakes created just for you! And I'm beyond thrilled to share these cakes with you! I'm talking, I would set off fireworks if I could, thrilled! So let's get started! !